Fast forward four years, and Khan is smashing 71* from 54 balls and grabbing two wickets on his way to being named Player of the Match in the Irish Senior Cup triumph over Merrion - Waringstown’s third in four years and sixth in total. In spite of having his best season in a Waringstown shirt, Khan will be denied the opportunity to return in 2019 due to a bizarre rule that means he isn’t considered a first-class cricketer after not playing enough games at the standard back in his homeland. His 786 runs is the seventh best tally of any player this season, while he has also taken 25 important wickets in a summer that has undoubtedly favoured the batsmen. Although he was aware when touching down in Northern Ireland in April that this could be his last one, it doesn’t make it any less frustrating for the 31-year-old. “It is something I knew coming into the season,” said Khan. “It is very frustrating because in cricket, the more experience you gain, the better you get. The more you play, the better you can think and better you play because it demands so much of your brainpower. “I was telling someone that it’s funny that after two years as a cricketer, you lose your professional status, but if you’re an accountant or doctor that doesn’t practice for a few years, you’re still an accountant or doctor. 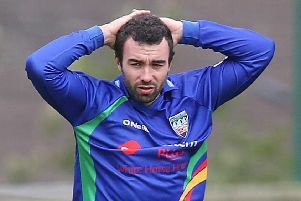 He suffered a back injury during the 2014 season that ruled him out of a return to the NCU the following year, with Ruhan Pretorious and Cobus Pienaar the professionals at Waringstown in 2015 and 2016 before Khan returned in 2017. The all-rounder has been unstoppable at points during this campaign, with his 126 single-handedly dragging his side over the line in the Challenge Cup semi-final against CIYMS. A second century came in the Twenty20 Cup against CSNI, and combine that with five fifties, it equates to an average of 46.24 and Khan feels his batting this year has been better than any other. “It’s a strange one. The first season I thought I was playing pretty well, but then I got a back injury and I crawled through it. “In terms of batting, it has been some of my best. It’s great that our opening partnership has been so good. I would have got to 1000 runs if they weren’t so good and not giving us much opportunity! Khan has been hugely successful in his time at The Lawn, picking up eight trophies in the last two seasons, and looking back over all the accolades, two this season sit close to the top of his list. “I’ve won probably more trophies in two seasons than a lot of people will win in their club career. “In terms of highlights, both Irish Cups, and in particular this year. This year seemed like a tougher game with tougher opponents than in 2017. “Last year, it was tough conditions to play in and the wicket wasn’t great. We also had a tough match in the Challenge Cup this year. He has thoroughly enjoyed the experience of competing in the NCU, and says he would always recommend the move to his fellow professionals. “Whenever I speak to other professionals, I always tell them they must come to Northern Ireland and give it a go. “Some pros get dejected with the standard of cricket in other places, but here you are never going to just walk over teams and that’s a good thing. “Even up until today I say to the best pros that if they want to go overseas to try Northern Ireland. As time goes on, the standard is going to get better and better. It leaves Khan with a difficult decision to make regarding his next move, but he says he won’t be taking just any offer that comes his way - it has to be the right one. “We will see what comes my way. My other options are Ireland, Holland and places like that. “The standard really has to be good for me to go there. It has to be Premier League or something, or it isn’t worth it. Captain Greg Thompson will now lead the almost impossible task of trying to find a replacement for Khan, and the skipper says the all-rounder has played a massive role at the club during his time there. “It’s no coincidence that the last two years have been our most successful as a club in terms of the amount of trophies we have won,” said Thompson. “It’s a credit to Shaheen, who statistically has performed, but his input and value is greater than statistics. “A lot of credit goes to him for those wins because he often rises to the occasion. “He is exactly what we wanted. He’s always been a genuine all-rounder, but we have probably relied more on his bowling. “This year, he has really come to the party with the bat. Off the field, he fits into the changing room really well and he has gelled well with everyone in the club.